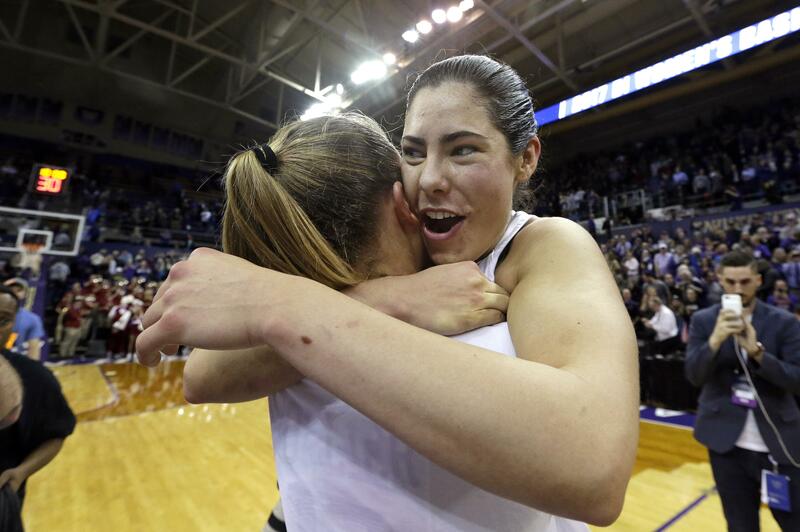 Tue., March 21, 2017, 6:45 p.m.
Kelsey Plum actually made a mistake on the night of her historic performance in the Washington women’s runaway basketball win over Oklahoma. It was before the game, when she forgot the introduction protocol that required her to go shake the hand of her Sooners counterpart. A teammate pointed it out to her, and she raced over to make amends. Big smile on her face. My bad, she seemed to say. She could be excused if she was distracted. It was her final game in front of the Husky fans who had watched her score more points in a career than any women player in NCAA history. And over the subsequent 40 minutes of play, the indefatigable and irrepressible Kelsey Plum again proved herself a competitive assassin, and maybe as tough on the court as any athlete UW has had. And regardless of the sport or gender, you don’t want to tick off those kinds of competitors. A trip to the NCAA Sweet 16 was at stake. Plum had a nice first half, particularly running the UW attack, handing out seven assists with her 14 points. But this was a competitive – no, combative – game. Early in the third quarter, the game still in serious contention, an Oklahoma player nailed Plum with an elbow to the neck. Flagrant foul. Plum reacted as you might expect. By burning the Sooners to the ground. She put in 17 points by herself that quarter, outscoring Oklahoma by three points on her own. As Oklahoma coach Sherri Coale said afterward, there simply aren’t enough adjectives to describe Plum’s skill set. But we’ll try anyway. She’s smooth off the drive, dead-eyed from distance, and if you collapse on her, she’ll drive and dish, like she did three times in the second quarter to Natalie Romeo, who finished hitting 6 of 10 3-pointers. The temptation is compare Plum to the Seattle Storm’s Sue Bird – a high compliment considering Bird turned into a nine-time WNBA All-Star, and a four-time Olympic gold medalist. But Bird never averaged more than 15 points a game in college, while Plum added the record as the highest single-season scoring total to the all-time career record she already held. Plum finished with 38 points and 11 assists in the 108-82 win, but it nonetheless was an impressive display by her teammates, as well. Aside from Romeo’s 20 points, Aarion McDonald added 18, and Chantel Osahor once again dominated inside with 16 points and 15 rebounds. Plum conceded that she’d thought a great deal about this being her last game in front of the UW fans. “There was no way I was losing this last game on our home court,” Plum said. Plum and Osahor were asked after the game about the cult of young followers who become devoted to the UW women’s team, which advanced to the Final Four last season. It should. Even longtime fans would have trouble naming a Husky through history who has, over the length of a career, shown as much competitive fervor, such tempered inner steel, and this elite skill level as Plum. And yet, she and her teammates also show an impressive depth of perspective. In the third quarter, when the officials were reviewing the replay of the flagrant foul to Plum’s throat, players on both benches engaged in an impromptu dance contest, which was picked up by the in-house video feed and shown on the big screen above center court. The moves were spectacular, with an Oklahoma player “winning” with a moonwalk down the sideline. Players from both teams were hooting. I’m not sure I’ve seen the likes of it, such fun in the heat of a crucial game. It was a display of joy while in the crucible of competition, of perspective, of knowing that you might take an elbow to the throat if you’re going to drive to the hoop, but otherwise, when it’s a dead-ball timeout and the music is play, well, everybody’s got to dance. Plum had to give credit where it was due. The Sooners probably won the danceoff. But that’s the only win they were going to get Monday night against Plum and the Huskies. Published: March 21, 2017, 6:45 p.m.